We started at 5.45 am from our meeting place - JP Nagar central mall. 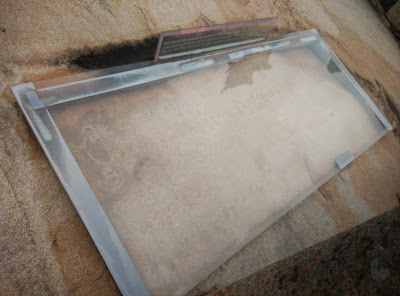 First place of visit was Shravanabelagola (166 kms), to avoid city traffic we took outer ring road (via PESIT college) to reach Yesthwathpur, took a left on NH 4 and headed straight on Bangalore - Nelamangala expressway. 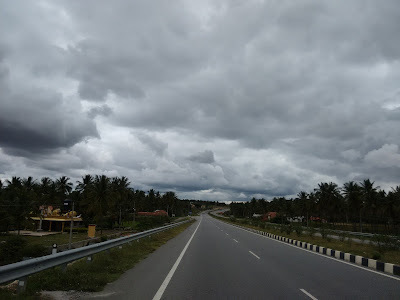 After Nelamangala took an exit towards Bangalore –Mangalore highway. 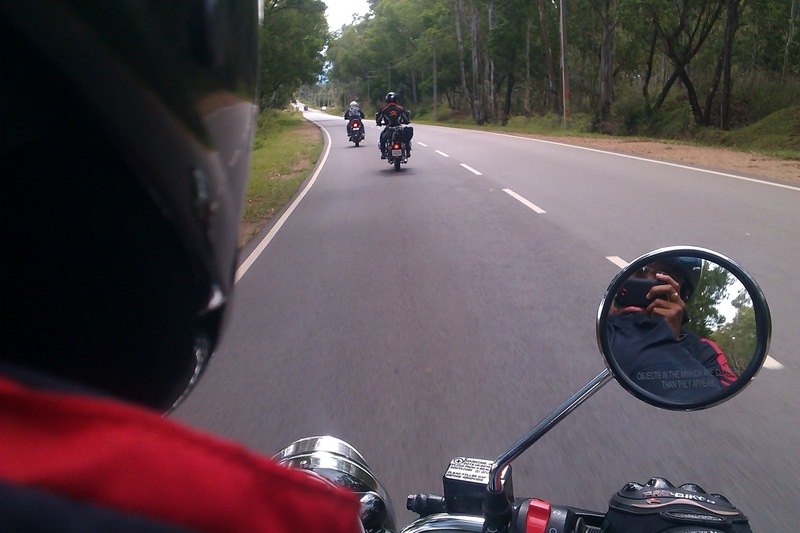 Roads are four way until Hassan, surrounding view and bike riding experience is just amazing. These are toll roads but luckily no tolls for bikers :). After having idly – vada and tea for breakfast at highway side hotel, we reached Shravanabelagola at around 10 am. 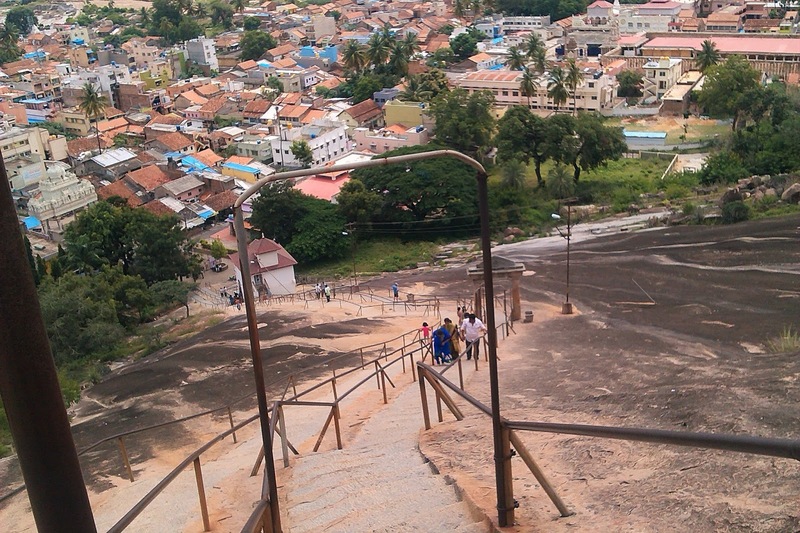 Temperature here was comparatively hot and also climbing stairs to reach temple with our backpacks and jackets was very tiring. On reaching temple entrance, we took locker and dumped all our things there. 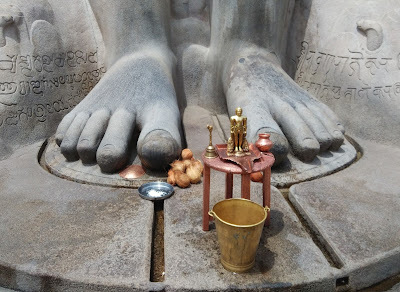 Shravanabelagola, literally meaning the ‘Monk of the white Pond’ named after belagola (white pond). This is one of the most important Jain pilgrim center in the country. This temple dedicated to Lord Gometeshwara or Bahubali. It is world renowned for the 58 feet and 8 inches tall sculpture of Gometeshwara. Mahamasthakabhisheka (ceremonial anointment) of the statue done once every 12 years. 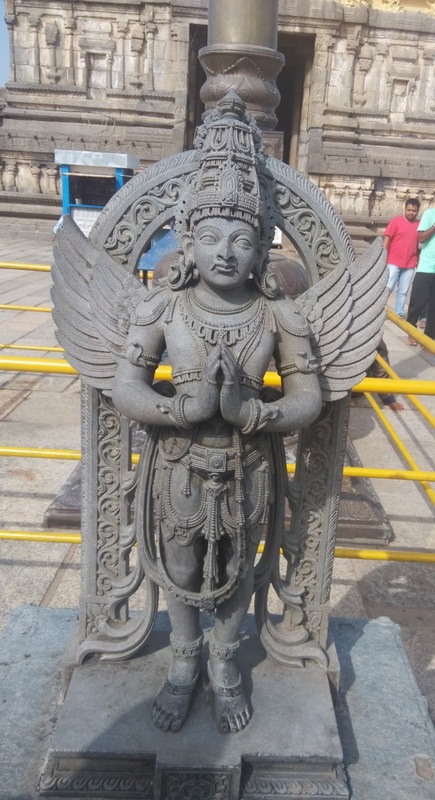 You will get to see similar statue of Gometeshwara in Dharmasthala (39 feet) and Karkala (41.5 feet), which is near to my hometown Udupi. Handwriting of Sri Rannakavi & Chamundarya. At 1 pm, we left for our next destination Belur (90 kms). Had lunch in small hotel (Shri Lakshmi Prasanna hotel) on Hassan – Belur road at 2 pm and resumed our ride. 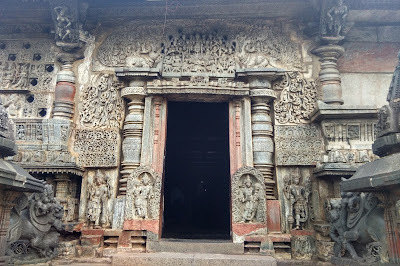 At 4 pm, we were at Belur – Chenna Keshava Temple. 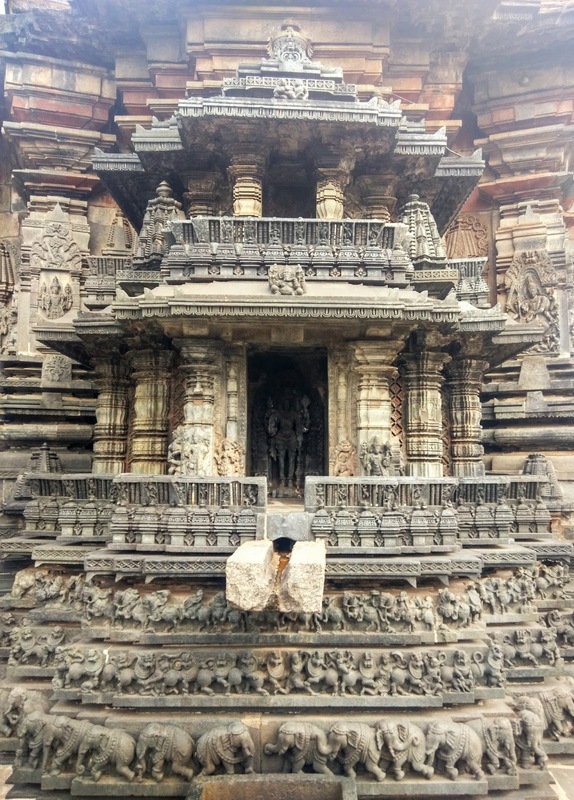 Belur was initially the capital of the Hoysala, but was later moved to Halebidu. 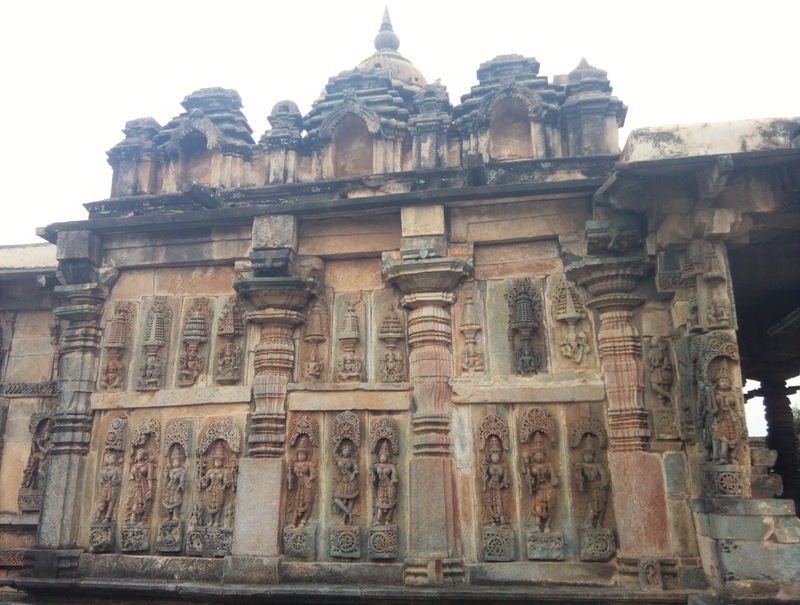 The temples and the monuments at Belur are indeed the best Hoysala creations that highlights the amazing architecture and sculptures in full glory. 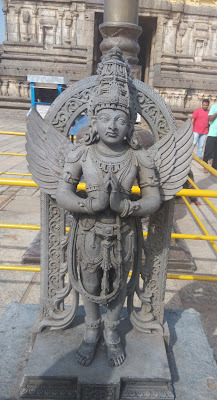 Belur was known as ‘modern Vaikuntha (Heaven) of the earth’. 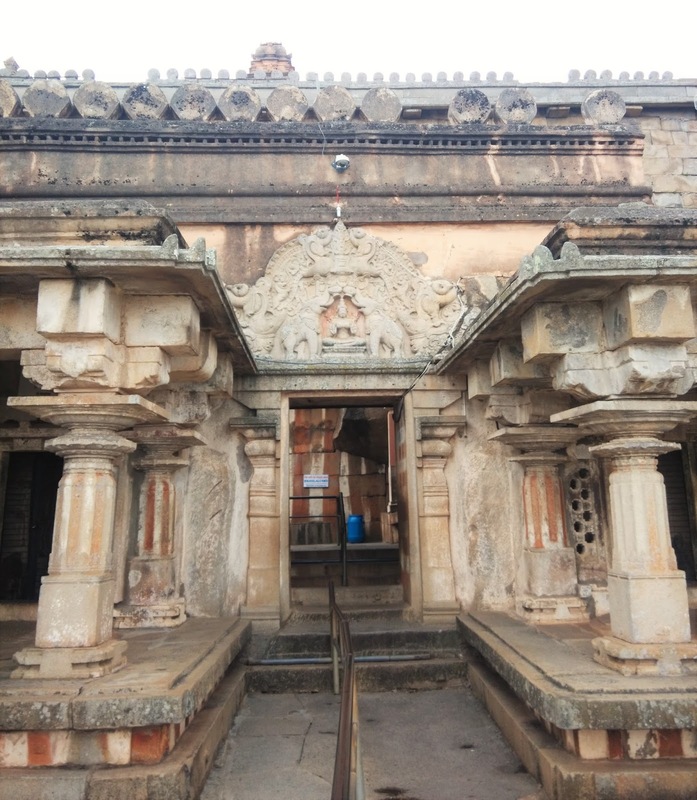 This temple is dedicated to Lord Vijayanarayan, one of the 24 incarnations was built to commemorate the victory of Hoysalas over Cholas in the battle of Talakad. 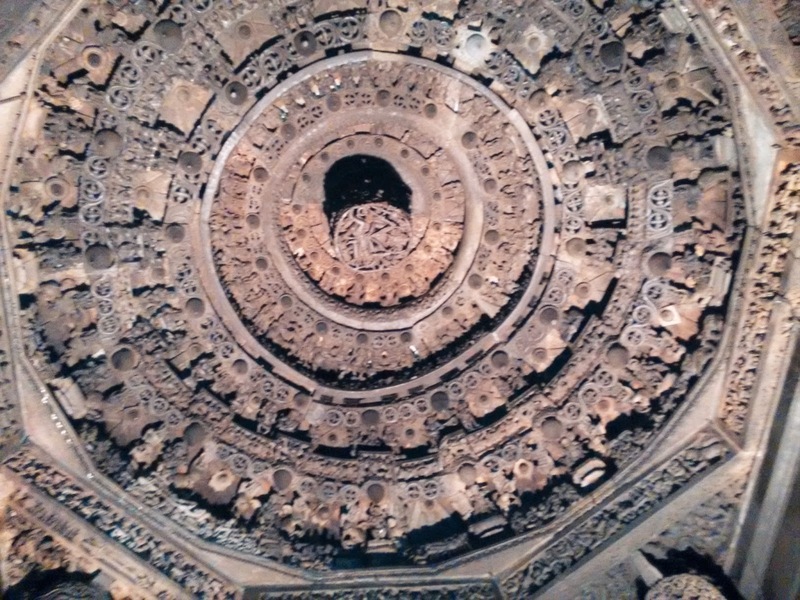 It took 103 years to complete this temple. The temple has two gateways but only one crowned with ‘gopuram’. There are temple guides available to explain the history of Belur in English/ Kannada/Hindi languages with nominal fees of Rs. 250. We all knew a little history about Hoysalas and Belur from history subjects in school but looking at the sculptures and monuments tempted us to go for a guide. Since all four of us were familiar with Kannada, we opted for explanation in Kannada language itself. Our Guide – Mr. Manjunath, started off with a question “neevu Halebidu nodi bandra ?” (Did you people visit Halebidu?) 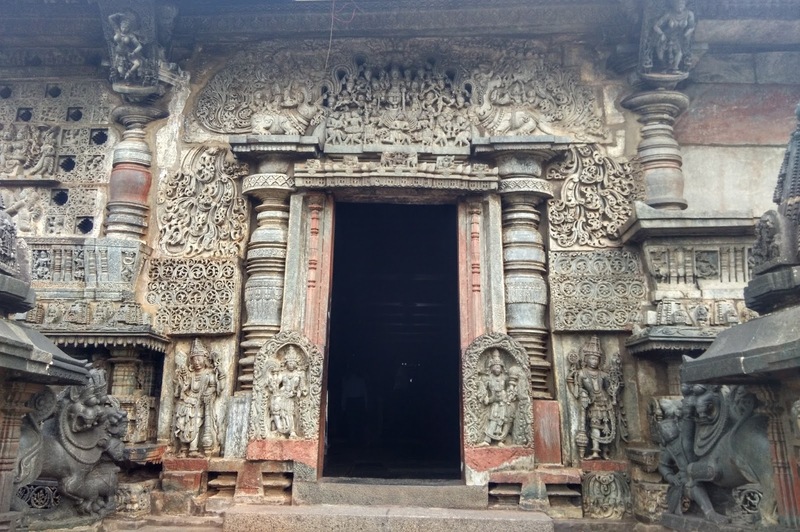 and then explaining the typical star shaped architecture of the Hoysala temples, finest carvings at the entrance and the lion symbol of Hoysala depicting their bravery. Other beautiful carvings - ‘Makara’ which is Shilpi’s (Artisan’s) imaginary animal having body parts of seven different animals. 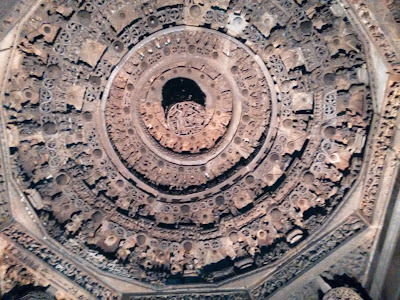 Finest carvings of Lord Narshima on ceiling. 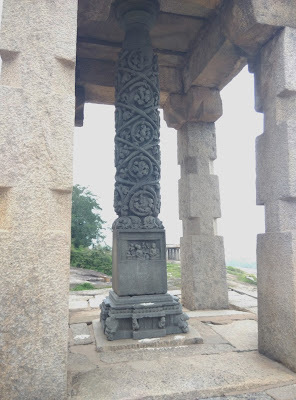 The Narasimha pillar, it is said that this pillar used to rotate on its own axis and resembled the entire temple as it contains all the temple carvings in this single pillar. 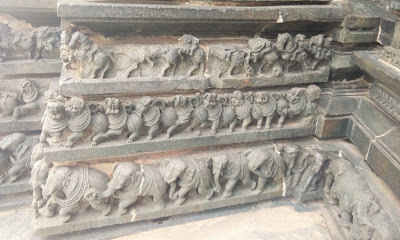 The Shilpi (Artisan) intentionally left one slot in the pillar without carving to challenge any artisan who wishes to do similar carvings there. Carvings of different hairstyles and the dresses that were worn, its believed that the modern clothes like skirt, shorts, hats etc were worn even in that 11th century. These sculptures make us believe that the history will repeat itself. 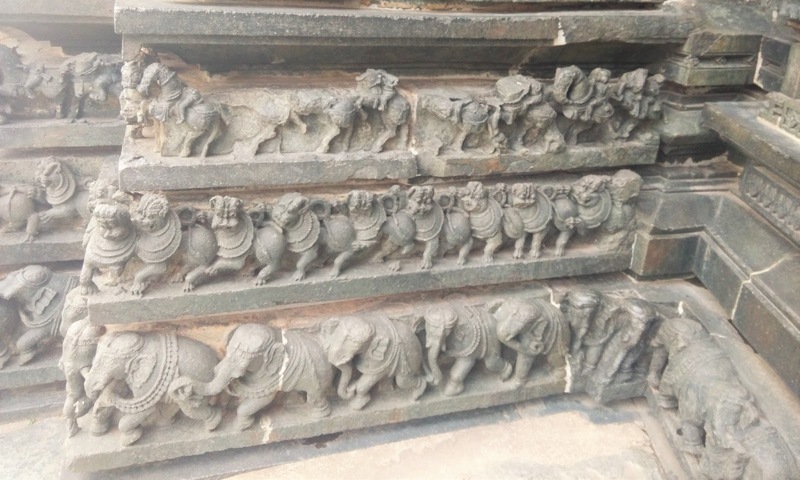 Three layers in temple platform - Elephants symbolizes strength, Lion for bravery & Horse for speed. Abhishekam of Lord Narayana seeps into an underground storage below this structure. 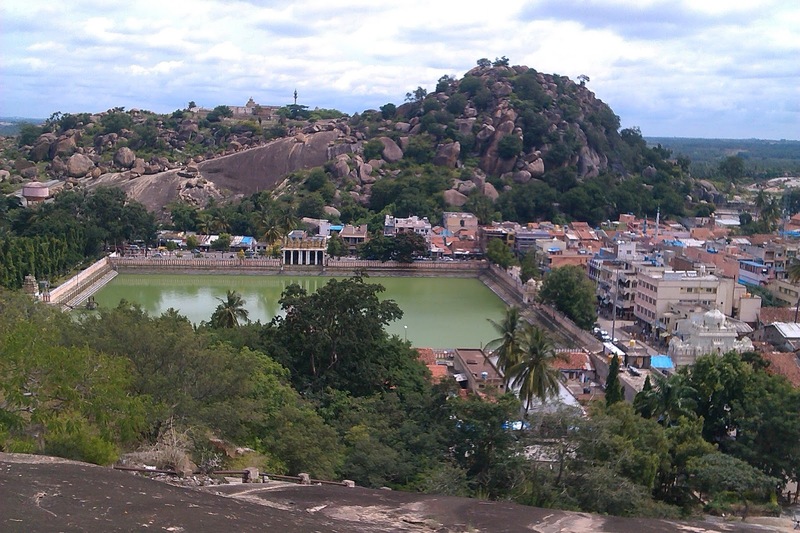 Temple tank (Kalyani or Pushkarni). The gravity pillar: 42 feet high pillar carved out of single rock and stands on its own weight. This temple is on the left of Chenna Keshava temple and adorned with an elegant vimana, said to resemble the vimana atop the Keshava temple. This temple lies to right of Chenna Keshava temple. 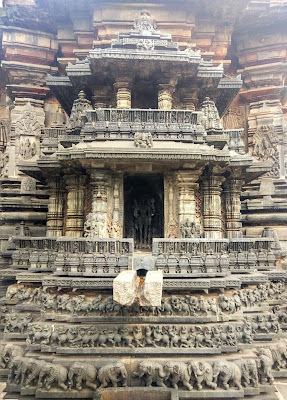 The temples at Belur were carved out of soapstone from Tumkur, this stone is easy to chisel, but attains iron like firmness when exposed to air. 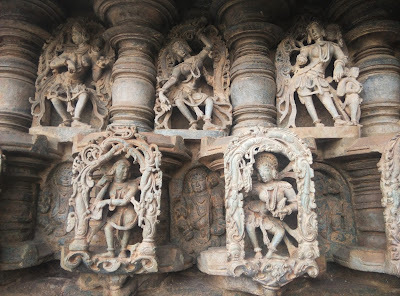 Manjunath took nearly 1.5 hrs covering most of the carvings and beautiful sculptures round the temple and concluded by saying "In Belur carefully see the carvings that are done inside the temple and do visit Halebidu to see carvings that are done outside the temple". This was too much of history at once so we all went around the temple again trying to recall it. 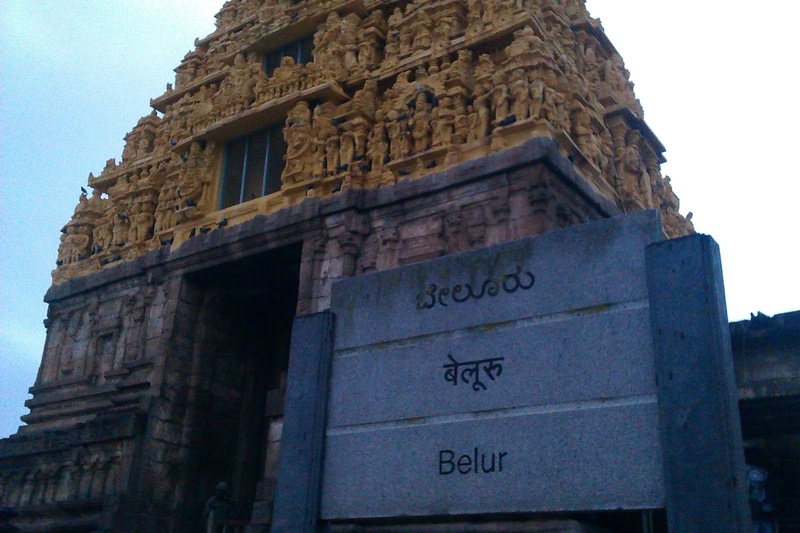 If you visit Belur next time, do opt for guide as it is definitely worth the amount you pay. 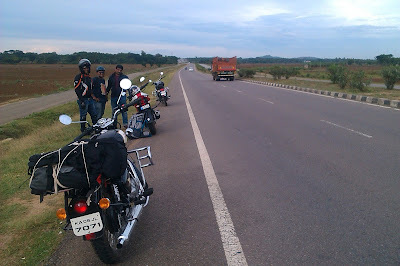 Our initial plan was night stay at Sakleshpur but due to continuous rain we had to divert towards Chikkamagaluru (22 kms). 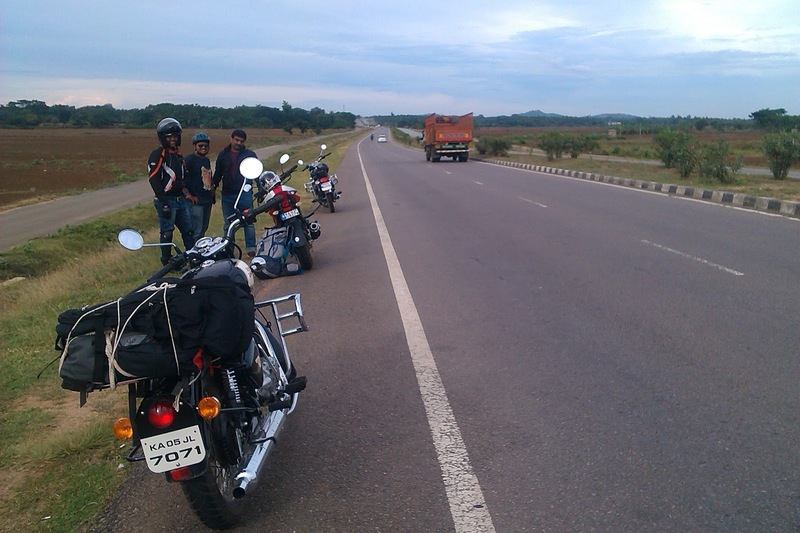 Riding in rain from Belur to Chikkamagaluru took us 1 hr. At 8 pm, we were at Chikkamagaluru and started our search for stay. Localities told us to check out for lodges on IG Road/ MG Road. Finally found a room in Emgee’s Residency lodge on MG Road @ Rs 1300/day. For dinner, we just walked down the city to check for available good hotel. 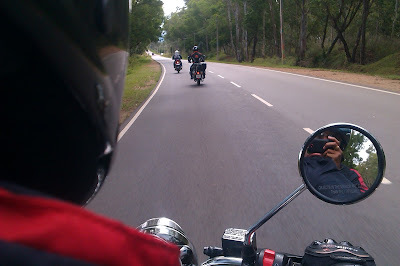 Bengaluru – Shravanabelagola – Belur – Chikkamagaluru -> Total ride for the day was around 285 kms.